In fact, there are a number of different approaches or terms within this broad heading, such as experiential learning, co-operative learning, adventure learning and apprenticeship. I will use the term ‘experiential learning’ as a broad umbrella term to cover this wide variety of approaches to learning by doing. 3.6.1. What is experiential learning? There are many different theorists in this area, such as John Dewey (1938) and more recently David Kolb (1984). cooperative (work- or community-based) learning. The focus here is on some of the main ways in which experiential learning can be designed and delivered, with particular respect to the use of technology, and in ways that help develop the knowledge and skills needed in a digital age. (For a more detailed analysis of experiential learning, see Moon, 2004). 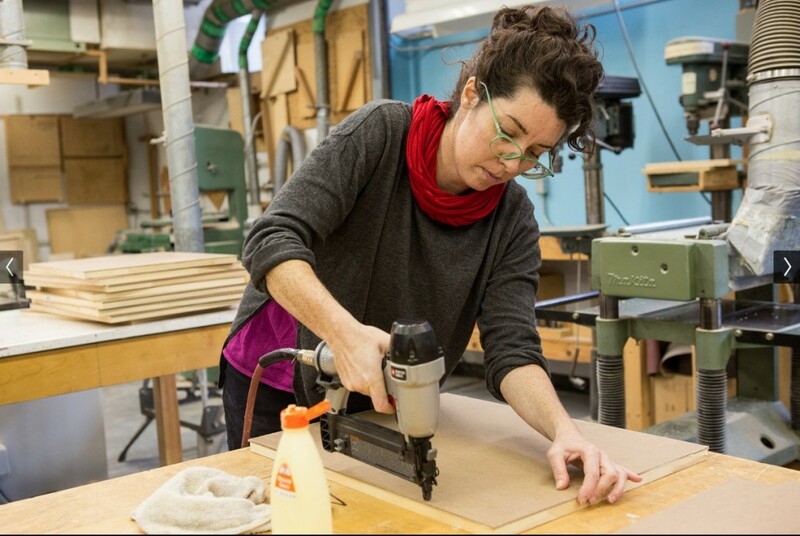 Experiential learning is a major form of teaching at the University of Waterloo. Its web site lists the conditions needed to ensure that experiential learning is effective, as identified by the Association for Experiential Education. Ryerson University in Toronto is another institution with extensive use of experiential learning, and also has an extensive web site on the topic, also directed at instructors. The next section examines different ways in which these principles have been applied. There are many different design models for experiential learning, but they also have many features in common. to enable students to design and create objects or equipment in different physical media. An important pedagogical value of laboratory classes is that they enable students to move from the concrete (observing phenomena) to the abstract (understanding the principles or theories that are derived from the observation of phenomena). Another is that the laboratory introduces students to a critical cultural aspect of science and engineering, that all ideas need to be tested in a rigorous and particular manner for them to be considered ‘true’. One major criticism of traditional educational labs or workshops is that they are limited in the kinds of equipment and experiences that scientists, engineers and trades people need today. As scientific, engineering and trades equipment becomes more sophisticated and expensive, it becomes increasingly difficult to provide students in schools especially but increasingly now in colleges and universities direct access to such equipment. Furthermore traditional teaching labs or workshops are capital and labour intensive and hence do not scale easily, a critical disadvantage in rapidly expanding educational opportunities. Because laboratory work is such an accepted part of science teaching, it is worth remembering that teaching science through laboratory work is in historical terms a fairly recent development. In the 1860s neither Oxford nor Cambridge University were willing to teach empirical science. Thomas Huxley therefore developed a program at the Royal School of Mines (a constituent college of what is now Imperial College, of the University of London) to teach school-teachers how to teach science, including how to design laboratories for teaching experimental science to school children, a method that is still the most commonly used today, both in schools and universities. At the same time, scientific and engineering progress since the nineteenth century has resulted in other forms of scientific testing and validation that take place outside at least the kind of ‘wet labs’ so common in schools and universities. Examples are nuclear accelerators, nanotechnology, quantum mechanics and space exploration. Often the only way to observe or record phenomena in such contexts is remotely or digitally. It is also important to be clear about the objectives of lab, workshop and studio work. There may now be other, more practical, more economic, or more powerful ways of achieving these objectives through the use of new technology, such as remote labs, simulations, and experiential learning. These will be examined in more detail later in this book. The earliest form of systematised problem-based learning (PBL) was developed in 1969 by Howard Barrows and colleagues in the School of Medicine at McMaster University in Canada, from where it has spread to many other universities, colleges and schools. This approach is increasingly used in subject domains where the knowledge base is rapidly expanding and where it is impossible for students to master all the knowledge in the domain within a limited period of study. Working in groups, students identify what they already know, what they need to know, and how and where to access new information that may lead to resolution of the problem. The role of the instructor (usually called a tutor in classic PBL) is critical in facilitating and guiding the learning process. 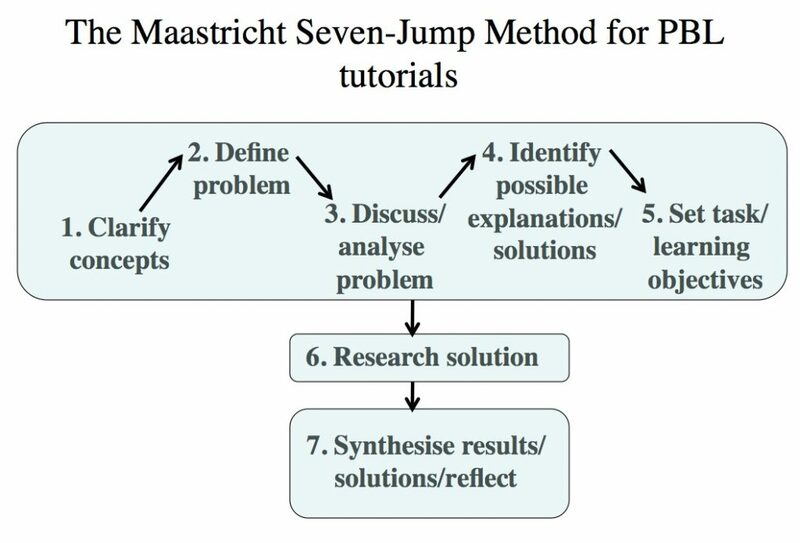 Traditionally, the first five steps would be done in a small face-to-face class tutorial of 20-25 students, with the sixth step requiring either individual or small group (four or five students) private study, with a the seventh step being accomplished in a full group meeting with the tutor. However, this approach also lends itself to blended learning in particular, where the research solution is done mainly online, although some instructors have managed the whole process online, using a combination of synchronous web conferencing and asynchronous online discussion. Developing a complete problem-based learning curriculum is challenging, as problems must be carefully chosen, increasing in complexity and difficulty over the course of study, and problems must be chosen so as to cover all the required components of the curriculum. Students often find the problem-based learning approach challenging, particularly in the early stages, where their foundational knowledge base may not be sufficient to solve some of the problems. (The term ‘cognitive overload’ has been used to describe this situation.) Others argue that lectures provide a quicker and more condensed way to cover the same topics. Assessment also has to be carefully designed, especially if a final exam carries heavy weight in grading, to ensure that problem-solving skills as well as content coverage are measured. However, research (see for instance, Strobel and van Barneveld, 2009) has found that problem-based learning is better for long-term retention of material and developing ‘replicable’ skills, as well as for improving students’ attitudes towards learning. There are now many variations on the ‘pure’ PBL approach, with problems being set after initial content has been covered in more traditional ways, such as lectures or prior reading, for instance. With case-based teaching, students develop skills in analytical thinking and reflective judgment by reading and discussing complex, real-life scenarios. Case-based learning is sometimes considered a variation of PBL, while others see it as a design model in its own right. As with PBL, case-based learning uses a guided inquiry method, but usually requires the students to have a degree of prior knowledge that can assist in analysing the case. There is usually more flexibility in the approach to case-based learning compared to PBL. Case-based learning is particularly popular in business education, law schools and clinical practice in medicine, but can be used in many other subject domains. Herreid (2004) provides eleven basic rules for case-based learning. Includes direct quotations from the characters. create a collaborative learning environment where all views are respected. Other configurations are of course also possible, depending on the requirements of the subject. Project-based learning is similar to case-based learning, but tends to be longer and broader in scope, and with even more student autonomy/responsibility in the sense of choosing sub-topics, organising their work, and deciding on what methods to use to conduct the project. Projects are usually based around real world problems, which give students a sense of responsibility and ownership in their learning activities. a meaningful project fulfills an educational purpose. The main danger with project-based learning is that the project can take on a life of its own, with not only students but the instructor losing focus on the key, essential learning objectives, or important content areas may not get covered. Thus project-based learning needs careful design and monitoring by the instructor. Inquiry-based learning (IBL) is similar to project-based learning, but the role of the teacher/instructor is somewhat different. In project-based learning, the instructor decides the ‘driving question’ and plays a more active role in guiding the students through the process. In inquiry-based learning, the learner explores a theme and chooses a topic for research, develops a plan of research and comes to conclusions, although an instructor is usually available to provide help and guidance when needed. 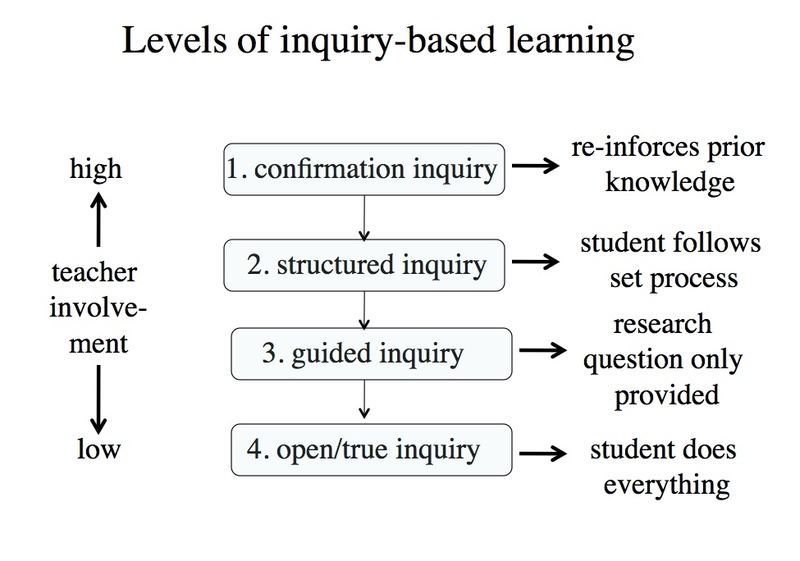 It can be seen that the fourth level of inquiry describes the graduate thesis process, although proponents of inquiry-based learning have advocated its value at all levels of education. fully online: increasingly, instructors are finding that experiential learning can be applied fully online, through a combination of synchronous tools such as web conferencing, asynchronous tools such as discussion forums and/or social media for group work, e-portfolios and multimedia for reporting, and remote labs for experimental work. Indeed, there are circumstances where it is impractical, too dangerous, or too expensive to use real world experiential learning. Online learning can be used to simulate real conditions and to reduce the time to master a skill. Flight simulators have long been used to train commercial pilots, enabling trainee pilots to spend less time mastering fundamentals on real aircraft. Commercial flight simulators are still extremely expensive to build and operate, but in recent years the costs of creating realistic simulations has dropped dramatically. 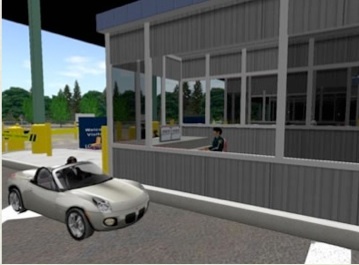 Instructors at Loyalist College have created a ‘virtual’ fully functioning border crossing and a virtual car in Second Life to train Canadian Border Services Agents. Each student takes on the role of an agent, with his/her avatar interviewing the avatars of the travellers wishing to enter Canada. All communication is done by voice communications in Second Life, with the people playing the travellers in a separate room from the students. Each student interviews three or four travellers and the entire class observes the interactions and discusses the situations and the responses. A secondary site for auto searches features a virtual car that can be completely dismantled so students learn all possible places where contraband may be concealed. This learning is then reinforced with a visit to the auto shop at Loyalist College and the search of an actual car. The students in the customs and immigration track are assessed on their interviewing techniques as part of their final grades. Students participating in the first year of the Second Life border simulation achieved a grade standing that was 28 per cent higher than the previous class who did not utilize a virtual world. The next class, using Second Life, scored a further 9 per cent higher. More details can be found here. Staff in the Emergency Management Division at the Justice Institute of British Columbia have developed a simulation tool called Praxis that helps to bring critical incidents to life by introducing real-world simulations into training and exercise programs. Because participants can access Praxis via the web, it provides the flexibility to deliver immersive, interactive and scenario-based training exercises anytime, anywhere. A typical emergency might be a major fire in a warehouse containing dangerous chemicals. ‘Trainee’ first responders, who will include fire, police and paramedical personnel, as well as city engineers and local government officials, are ‘alerted’ on their mobile phones or tablets, and have to respond in real time to a fast developing scenario, ‘managed’ by a skilled facilitator, following procedures previously taught and also available on their mobile equipment. The whole process is recorded and followed later by a face-to-face debriefing session. Once again, design models are not in most cases dependent on any particular medium. The pedagogy transfers easily across different delivery methods. Learning by doing is an important method for developing many of the skills needed in a digital age. How one evaluates experiential learning designs depends partly on one’s epistemological position. Constructivists strongly support experiential learning models, whereas those with a strong objectivist position are usually highly skeptical of the effectiveness of this approach. Nevertheless, problem-based learning in particular has proved to be very popular in many institutions teaching science or medicine, and project-based learning is used across many subject domains and levels of education. There is evidence that experiential learning, when properly designed, is highly engaging for students and leads to better long-term memory. Proponents also claim that it leads to deeper understanding, and develops skills for a digital age such as problem-solving, critical thinking, improved communications skills, and knowledge management. In particular, it enables learners to manage better highly complex situations that cross disciplinary boundaries, and subject domains where the boundaries of knowledge are difficult to manage. In so far as there is any evidence from controlled studies, it almost uniformly supports direct, strong instructional guidance rather than constructivist-based minimal guidance during the instruction of novice to intermediate learners. Even with students with considerable prior knowledge, strong guidance when learning is most often found to be equally effective as unguided approaches. Certainly, experiential learning approaches require considerable re-structuring of teaching and a great deal of detailed planning if the curriculum is to be fully covered. It usually means extensive re-training of faculty, and careful orientation and preparation of students. I would also agree with Kirschner et al. that just giving students tasks to do in real world situations without guidance and support is likely to be ineffective. However, many forms of experiential learning can and do have strong guidance from instructors, and one has to be very careful when comparing matched groups that the tests of knowledge include measurement of the skills that are claimed to be developed by experiential learning, and are not just based on the same assessments as for traditional methods, which often have a heavy bias towards memorisation and comprehension. On balance then, I would support the use of experiential learning for developing the knowledge and skills needed in a digital age, but as always, it needs to be done well, following best practices associated with the design models. 1. If you have experiences with experiential learning, what worked well and what didn’t? 2. Are the differences between problem-based learning, case-based learning, project-based learning and inquiry-based learning significant, or are they really just minor variations on the same design model? 3. Do you have a preference for any one of the models? If so, why? 4. Do you agree that experiential learning can be done just as well online as in classrooms or in the field? If not, what is the ‘uniqueness’ of doing it face-to-face that cannot be replicated online? Can you give an example? 5. Kirschner, Sweller and Clark’s paper is a powerful condemnation of PBL. Read it in full, then decide whether or not you share their conclusion, and if not, why not. If you wish to share any of the outcomes of this activity, please use the comment box below, for possible feedback. Gijselaers, W., (1995) ‘Perspectives on problem-based learning’ in Gijselaers, W, Tempelaar, D, Keizer, P, Blommaert, J, Bernard, E & Kapser, H (eds) Educational Innovation in Economics and Business Administration: The Case of Problem-Based Learning. Dordrecht, Kluwer. Herreid, C. F. (2007). Start with a story: The case study method of teaching college science. Arlington VA: NSTA Press. 3.6 Experiential learning: learning by doing (2) by Anthony William (Tony) Bates is licensed under a Creative Commons Attribution-NonCommercial 4.0 International License, except where otherwise noted.